Thruxton is a very fast circuit in excess of 2 miles and ideal to experience the highlights of the day, 6 laps in a Formula Renault single seat racing car and 4 laps in the Ferrari 355. The morning finishes with a high speed lap driven by a professional driver in a Touring car which has all the racing upgrades to provide the power and handling to leave you breathless whilst you realise your own limitations. The Ultimate Driving Day features circuit driving in the morning and either the 4x4 Off Road driving or outdoor karting in the afternoon. The karting takes place on a new 1100 metre circuit which is one of the very best in the country and offers serious karting in the latest outdoor karts. 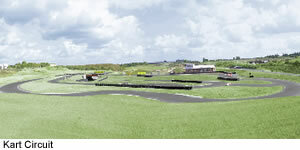 KARTING ON THE 1100 METRE OUTDOOR CIRCUIT WITH THE BEST AVAILABLE HIGH SPEED KARTS. 4 X 4 OFF ROAD DRIVING ON A NEW PURPOSE BUILT COURSE IN THE LATEST DISCOVERY TD 5.